This is a review of a recycled binary options scam called “1 Click Profits”. When we first looked at One Click Profits, we immediately recognized the software. It is the same app as used by My First Online Payday scam. So it was immediately obvious what we were dealing with. The video presentation of 1 Click Profits tries to persuade you that you can make a lot of money just by clicking on one of two buttons. For this purpose you are given a trading account where you try 10 trades with an initial balance of $50. After 10 trades you’ll see that your balance increased to $250 – $400. So these scammers do not even bother to make an app that looks like trading software, it is just a gaming machine. But it does not matter, because it is just one big fake. In reality you are not trading anything with the 1 Click Profits software. And the money is of course fake too. Look at what happens if you try to withdraw the balance after 10 trades. You are told that you have to first deposit $250! So it is a pure scam. And how does it work? These scammers are affiliated with a certain broker and will get paid for every new depositor they can refer. This is why they created this game with fake trades and fake money, they need you to deposit, this is how they earn their commissions. 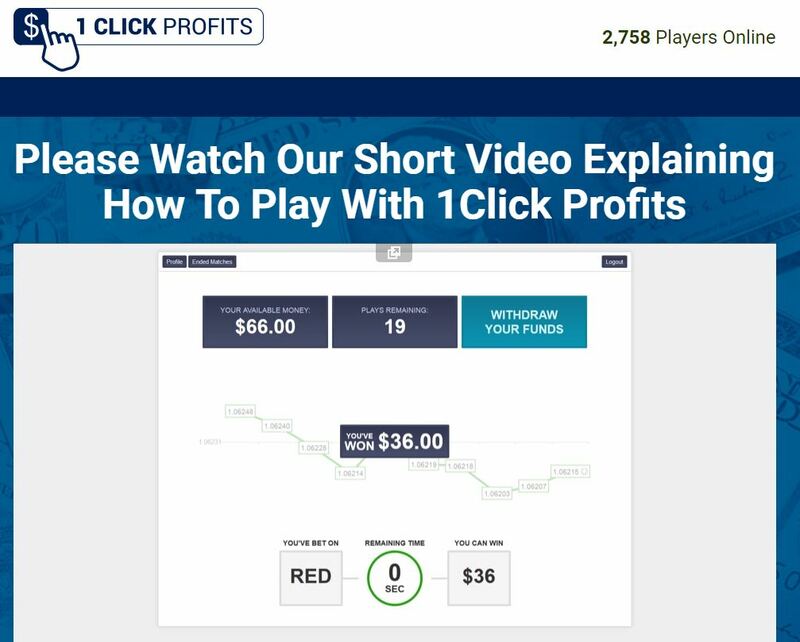 1 Click Profits really is just a renamed scam, it is using the same app and the same video as My First Online Payday. This same scam software is now also used by Signals Echange Network. Stay away from One Click Profits, because it is a scam designed to take money away from you. Their game is a big fake. If you want to try real binary options trading, do it on a free demo account. There you will see that you can make money in binary options trading, but it is more difficult than just clicking what you are told by scammers.